Hi, I am one of the new Designers to join the New Gel Press team, and I am very excited to share the news here. So who or what is Gel Press? 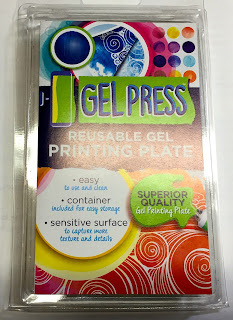 Gel Press is the new brand name of those gel printing plates. The Company that makes them is called Polygel. They make the original gel mono printing plate for which they have the patent. Years ago the formula was made under a private label for another company.... Now, that same company is having its plates made elsewhere and with another source. The company Polygel really believes in its product and its quality. So Polygel launched Gel Press to keep the quality plate they know performs well, in the market and available to consumers. Polygel is the manufacturer and can offer the Gel Press to retailers and their customers with a significant price advantage. Note I am a Designer for this company now and wish to let my readers have accurate information. Thank you for stopping by. Come back soon to see more Crafty Goodies.